Picture subtraction worksheets utilize colorful visual aids, which engage the children and make the process of learning subtraction fun! The worksheets include picture subtraction facts, count and subtract, cross out and count, writing and completing subtraction sentences, column subtraction, dice subtraction and more. Recommended for Kindergarten and Grade 1 children. This set of picture subtraction worksheets will require Kindergartner to count the images and then subtract to find the difference. Children are required to observe the picture model scrupulously and find the difference. 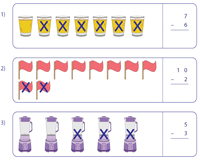 Also, count the uncrossed images and complete the subtraction problems provided in the vertical format. 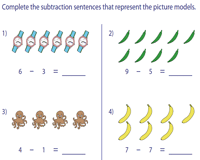 The picture subtraction worksheets featured here will facilitate the grade 1 children to count the pictures, subtract and find the difference. Use the answer key to verify your solutions. 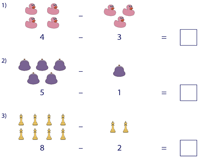 Complete the subtraction equations by either counting the pictures or using the cardinal numbers given for each set of pictures. 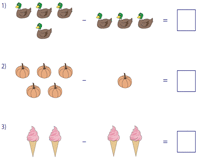 Write down the subtraction sentences based on the pictures displayed in each problem. Check your answers with the help of the answer key. 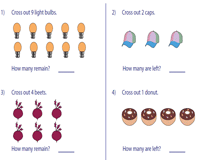 These colorful picture subtraction worksheets will require Kindergarten and grade 1 children to cross out and count the pictures to determine how many items remain. This compilation of worksheets helps the beginners to understand take away concept using the picture model. 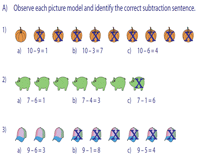 Complete the subtraction problems represented in the vertical form. 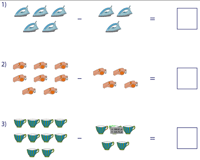 This collection of worksheets reinforces subtraction concept using a visual representation. 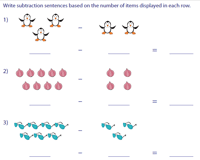 Count and write the subtraction sentence that represents the picture model. Children will need to cross out and count to complete the subtraction sentences provided for each set of pictures. 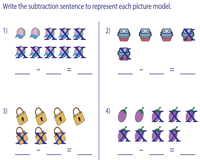 Identify the correct subtraction sentence that represents the given picture model. 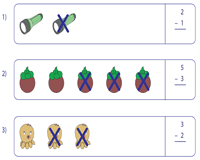 Also, match the correct picture model that represents the subtraction sentence. 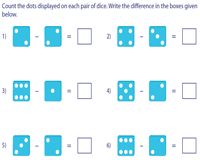 Count the dots displayed on each pair of dice featured in these worksheets. Then, subtract to find the answers. Teacher template is included. 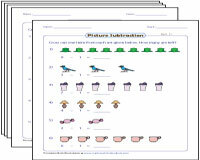 You are just a click away to access an enormous collection of picture subtraction facts worksheets. Kindergarteners will acquire ample practice on subtraction facts with numbers ranging from 1 to 10.